Nigerian Army University Biu's [NAUB] Matriculates One Thousand Sixteen [1,016] Pioneer Students During the Maiden Matriculation Ceremony of Freshmen for 2018/2019 Academic Session. The Nigerian Army University, Biu (NAUB) on Thursday matriculated 1, 016 pioneer students admitted for the 2018/2019 academic session. The students were admitted into the faculties of Arts, Management and Social Sciences; Computing, Engineering, Environmental Sciences and Natural and Applied Sciences. Speaking at the matriculation ceremony held at the university’s permanent site in Biu local government area of Borno State, the Acting Vice Chancellor, Professor David Iliya Malgwi, said thousands of applications were received but few were admitted based on the requirements as prescribed by NUC and JAMB. He added that apart from the matriculating students, another 1,000 were admitted for the university’s one-year remedial programme for the 2018/2019 academic session. Professor Malgwi urged the students to avoid wrong dissemination of information via social media and other social vices such as cultism, examination malpractices, hooliganism, indecent dressing, drug abuse and sexual abuse. The vice chancellor assured the students that the Chief of Army Staff (COAS), Lieutenant General Tukur Yusuf Buratai has put all security measures in place to check any form of security threat. “People of Biu are peaceful and adequate security measures have been put in place to guarantee your safety during your stay here. However, there is absolute need for you to be security conscious,” he said. In his remarks, General Buratai who is also the Chairman of the governing council of NAUB assured the matriculating students that the university would continue to provide all necessary logistics and conducive environment to enable them undertake their academic activities under secured and peaceful atmosphere. 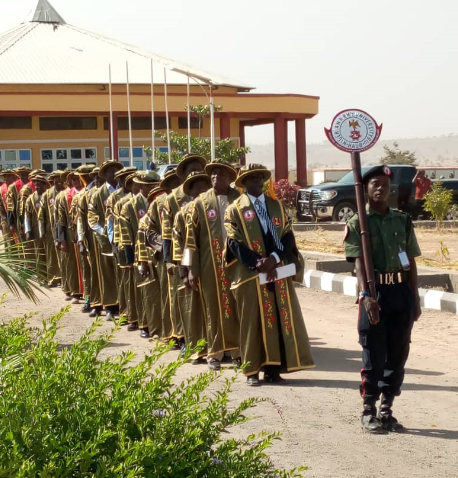 Represented by Major General Chukwuka Okonkwo, the COAS pledged to employ best graduating students as lecturers and other category of staff at the end of their studies. Buratai said the Nigerian Army is recording tremendous success in the current fight against insurgency.